I find it difficult to pay my Globe internet bill online. I’ll try to pay using the globe website but I cannot go through. I also tried using my BDO Online banking account but Globe internet is not available in the company biller list. Unlike before when I am using smart internet, I can pay my monthly bill using BDO, hassle free and very convenient, in a simple click I am done paying my bill, I also created a tutorial how to pay smart bills online. Since I am now using globe, maybe you are wondering why I transfer to globe, I have no major problem on my smart internet before, I cancel my smart subscription because I stay in my brother’s place in Batangas for almost a year and when I came back, I apply again in smart but the Canopy type which is my previous internet is not available only the latest Ultera which is not yet available in my place. Ok, now that I am using globe and cannot pay my monthly bill online, I have to pay it manually using Bayad Centers which are also available near my place. Paying in Bayad Centers is also easy, but you need to go out and sometime fall in line, although it is available in almost all money remittances like Western Union (WU). I choose to pay in WU and here is the my experience. 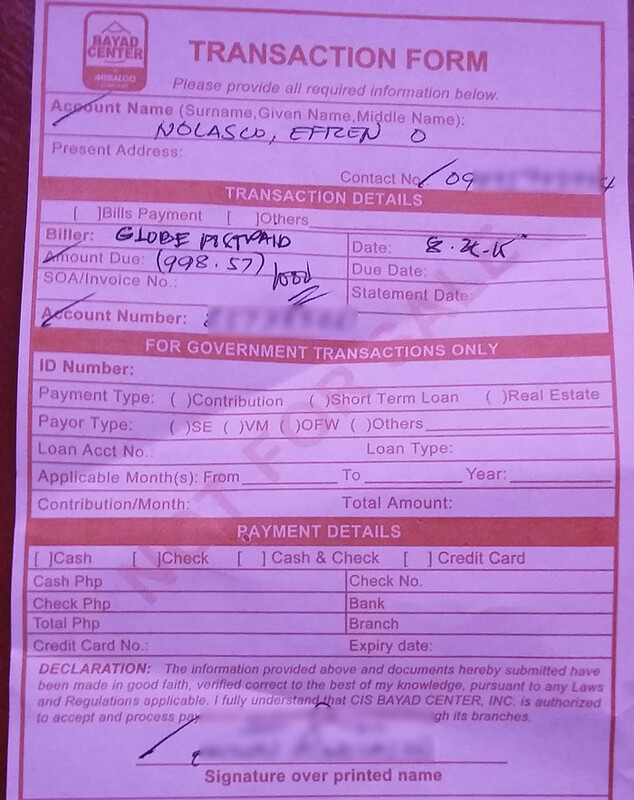 When I arrived in the WU I tell the counter that I want to pay my Globe Internet bill, the counter gave me a Bayad Center Transaction Form and checked the entry needed to be filled up. Paying in Bayad Centers need your internet account number, account name, contact number and the amount to be paid. Enter all this information in the form that given by the counter like in the image below. 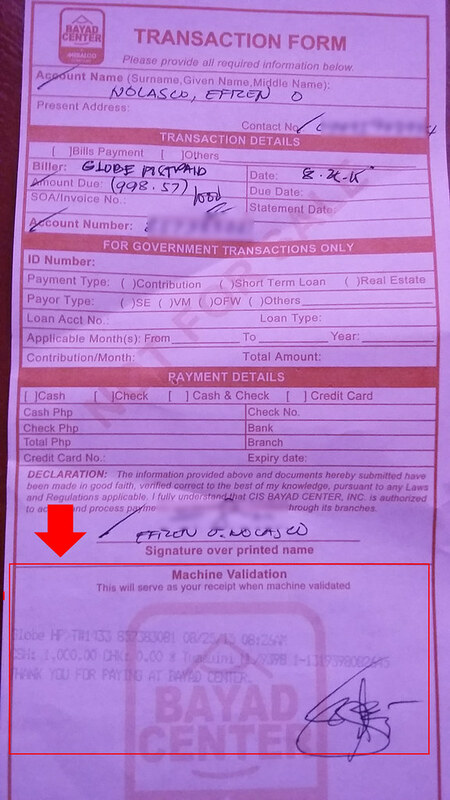 Once all the info is complete, return the form into the counter and wait to call your name, once called give the amount needed and wait for the receipt which is the same form you give with electronic print on the Machine Validation area of the form, see it below. That’s how easy to pay in bayad center, although sometimes I feel inconvenience, specially when I need to fall in line and wait for my turn but overall its ok to pay in bayad centers. You can also pay other bills like smart internet, SSS, PhilHealth etc. Vivaldi Browser: Better than Chrome and Firefox?